For the seventh Lubavitcher Rebbe, see Menachem Mendel Schneerson. For the Tzemach Tzedek of Nikolsburg, see Menachem Mendel Krochmal. Menachem Mendel Schneersohn (September 9, 1789 (29 Elul 5549) – March 17, 1866 (13 Nissan 5626) OS) also known as the Tzemach Tzedek was an Orthodox rabbi, leading 19th-century posek, and the third Rebbe (spiritual leader) of the Chabad Lubavitch chasidic movement. 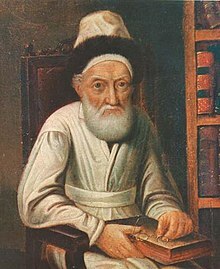 The Tzemach Tzedek was born in Liozna, on September 9, 1789. His mother Devorah Leah died just three years later, and her father Rabbi Shneur Zalman of Liadi raised him as his own son. He married his first cousin Chaya Mushka Schneersohn, daughter of Rabbi Dovber Schneuri. After his father-in-law/uncle's death, and a three-year interregnum during which he tried to persuade the Hasidim to accept his brother-in-law Menachem-Nachum Schneuri or his uncle Chaim-Avraham as their leader, he assumed the leadership of Lubavitch on the eve of Shavuot 5591 (May 5, 1831 OS). He was known as the Tzemach Tzedek ("Righteous Sprout" or "Righteous Scion"), after the title of a voluminous compendium of halakha (Jewish law) that he authored. He also authored Derech Mitzvotecha ("Way of Your Commandments"), a mystical exposition of the Mitzvos. He compiled major works of Rabbi Shneur Zalman of Liadi for publication, including the Siddur L'Kol Ha'Shanah (commonly known as Siddur Im Dach), Likutei Torah and Torah Ohr. He also authored a philosophical text entitled "Sefer Chakira: Derech Emuna" (Book of Philosophy: The Way of Faith). The Tzemach Tzedek enjoyed close ties with other Jewish leaders. In the course of his battle against the Haskalah in Russia, he forged a close alliance with Rabbi Yitzchak of Valozhyn, a major leader of the misnagdim, which led to warmer relations between them and the Hasidim. According to Baruch Epstein, his father Rabbi Yechiel Michel Epstein spent six months under the Tzemach Tzedek's tutelage, and learned most of his mystical knowledge during that time. This story is disputed by Hassidic historian Yehoshua Mondshine. His close friendship with professor J Berstenson, the Czar's court physician, often helped the delicate negotiations relating to the welfare of the community. He set up an organisation called Hevras Techiyas Hameisim to assist Jewish boy-soldiers who were being recruited and converted to Christianity by the Russian army. These soldiers known as Cantonists were taken away from the Jewish community to other villages. Schneersohn arranged for his students to pay them regular visits to keep up their spirits and discourage them from converting. In 1844–45 he took steps to increase the enrollment and viability of the Lubavitch Yeshivas in Dubroŭna, Pasana, Lyozno and Kalisz, expanding their enrollment to around 600 students in total. Repeated attempts by the authorities to entrap him using informers such as Hershel Hodesh, Benjamin the Apostate and Lipman Feldman failed. He died in Lubavitch on 13 Nissan 5626 (March 17, 1866) at the age of 77, leaving behind him seven sons and two daughters. He was succeeded by one of his youngest sons, Shmuel as the Rebbe of Lubavitch, while three of his other sons formed breakaways of the Chabad movement which continue to some extent even today. A famous saying of the Tzemach Tzedek is Think good and it will be good (original Yiddish: Trakht gut vet zein gut). This expresses the Chabad view that simply by virtue of a person's trust in God, that person's prayer may be answered. 1. Rabbi Baruch Shalom (1805–1869) did not become a rebbe in his own right; he chose to remain in Lubavitch and become a chasid of his youngest brother. Rabbi Menachem Mendel Schneerson, the seventh Rebbe of Chabad-Lubavitch, was his great-great-grandson. Rabbi Shalom Dovber Schneersohn of Rechitsa (d. 1908), known as the Rashab of Rechitsa. Succeeding his brother, Rabbi Shlomo Zalman, Rabbi Shalom Dovber served as the Kopuster movement's rebbe in the town of Rechitsa. Rabbi Shalom Dovber seems to have died without a successor. 3. Rabbi Chaim Schneur Zalman (1814–1880) was Rebbe in Lyady after his father, the Tzemach Tzedek died. He founded the Liadi branch of Chabad. He was succeeded by his son, Rabbi Yitzchak Dovber (1835–1910) of Liadi, author of Siddur Maharid, and his son-in-law, Rabbi Levi Yitzchak (d. 1905) of Siratin, a scion of the Rebbe of Radzimin. 4. Rabbi Yisroel Noach (1815–1883) of Nizhyn founded the Niezhin branch of Chabad. Although officially a Rebbe, he had only a small following. He had no successor. His son was Rabbi Avraham Schneerson of Kischinev, whose daughter, Nechama Dina Schneersohn, married Rabbi Yosef Yitzchak Schneersohn, the sixth Rebbe of Chabad-Lubavitch. 5. Rabbi Yosef Yitzchak (1822–1876) was a Rebbe in Ovruch. He founded the Avrutch branch of Chabad. He was compelled to assume this position by his father-in-law, Rabbi Yaakov Yisroel of Cherkas (son of Rabbi Mordechai of Chernobyl and son-in-law of the Mitteler Rebbe) against his father's wishes. He was the maternal grandfather and namesake of Rabbi Yosef Yitzchak Schneersohn, the sixth Rebbe of Chabad-Lubavitch. 6. Rabbi Yaakov, although leaving descendants, died at quite a young age. He lived in Orsha. Little is known about him. 7. Rabbi Shmuel Schneersohn (Maharash) (1834–1882) of Lubavitch, his youngest son, succeeded him as the Rebbe of Lubavitch. Rabbi Menachem Mendel Schneerson said of the Tzemach Tzedek's work "Ohr HaTorah" that it contains all the previous and future teachings of the Chabad Rebbes. Responsa Tzemach Tzedek - 8 vols. Tzemach Tzedek Responsa. His mastery in Talmud as well as mysticism won friendship from non-Hasidic scholars and helped resolve the Hasidic-Mitnagdic schism. ^ "Tzemach" (צמח) has the same gematria as "Menachem" (מנחם), and "Tzedek" (צדק) has the same as "Mendel" (מענדל). The original responsa Tzemach Tzedek were those of Menachem Mendel Krochmal. Schneersohn's responsa are known as Shu"t Tzemach Tzedek Hachadashot, "the new Tzemach Tzedek responsa". Rabbi Menachem Mendil Hager, the first Viznhitzer Rebbe, called his commentary on the Torah Tzemach Tzadik (צמח צדיק), because he spelled his name with an extra yod (מענדיל). ^ The Tzemach Tzedek and the Haskalah Movement, Official Chabad history. ^ The claim is in Mekor Baruch, chapter 20. But see Mekor Baruch - Mekor Hakzavim by Yehoshua Mondshein. ^ H. Rabinowicz (1970). The World of Hasidism. Hartmore House. p. 134. ISBN 0-87677-005-7. ^ The introduction to Hayom Yom, by Rabbi Menachem Mendel Schneerson. A brief biography of Rabbi Menachem Mendel, the "Tzemach Tzedek"